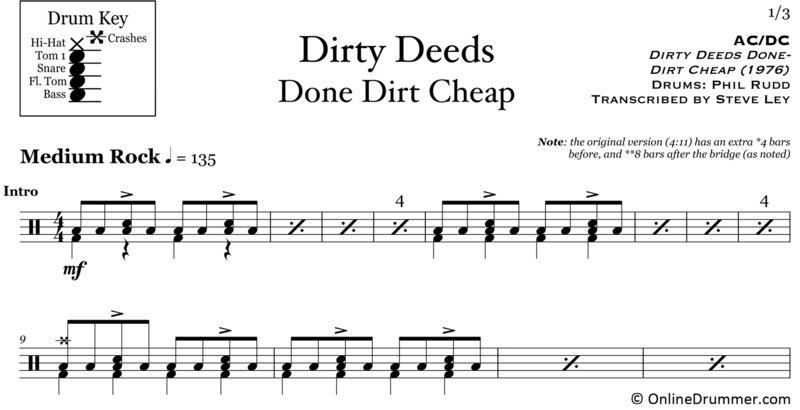 The full drum sheet music for “Dirty Deeds Done Dirt Cheap” by ACDC from the album Dirt Cheap (1976). Phil Rudd plays a powerful tom groove throughout the intro and verses. The groove is straightforward to play, but it’s at a healthy 135 bpm. The chorus is unique, as the crash cymbals accent along with the vocals, “DONE DIRT CHEAP.” This is a great song for beginner to intermediate drummers looking to improve speed and endurance.